There's an expression "to look like Death warmed over". The similar expression in Danish is "to look like Death from Lübeck". I have always wondered what this charming Christmas-city, with its great beer and overly sweet marzipan, had done to deserve such a disparaging sobriquet. While researching for a Danish site about tarot I found the answer. "Death from Lübeck" was a 30 meter painting, showing Death in a long chain-dance with 24 humans - painted life-size - from all classes of society, from pope to infant. Death dances around in the procession, calling people to the dance, but most of the dancers-to-be try to decline. Pictures and text are combined so we have what may be one of the world's first and greatest comic strips. The dance of death in Tallinn, Estonia. The painting was destroyed during the 2nd world war and, anyway, it was only a copy since the original medieval painting from 1463 had been replaced by a new one with a new text in 1701. On the other hand there's still a fragment (yes, 7½ meters is a fragment) of a very similar painting in Tallinn, which can still be visited, and where one can read parts of the original medieval text. 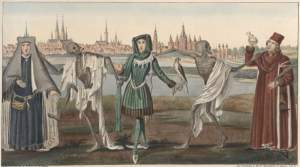 The dance of death was a popular and wide-spread theme in the late Middle Ages. On these pages there are samples all the way from metropols like Berlin, London, Paris and Basel to Malmø and Nørre Alslev. All over Europe one could see the long chain dances with Death dancing away with citizens from all walks of society. The subject for this site is the original medieval dance of death, but I have added two sections outside this scope. The first one is Hans Holbein, whose famous woodcuts were published in 1538. Instead of a chain dance, Holbein depicted a number of independent scenes, showing how Death lurks everywhere: at home, on the road, at sea etc. In this manner Holbein de facto changed the entire genre, and I have dedicated a large section to showing how he influenced other artists. The other thing is that being a Dane I have an interest in documenting Danish dances of death. 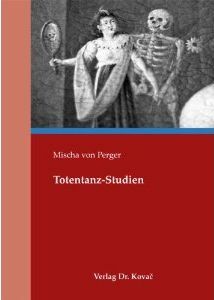 I would like to thank Patrick Pollefeys and Per-Erik Skramstad for support and inspiration, and Mischa von Perger for correcting errors without number. The hands are used for navigating back and forth between related pages on the same level. The fifer is at the bottom of every page and will bring you one level up in the hierarchy. The horizontal bone is purely ornamental - clicking it won't do anything. Small red numbers in parenthesis(1) are footnotes. This is what a footnote looks like. You close the footnote by simply clicking the skull in the top, right corner. You can move the note around by dragging the headline. If the text is too long, you can resize the note by pulling the edges and corners.